The Inaugural Hamilton Croatia Hockey Day. 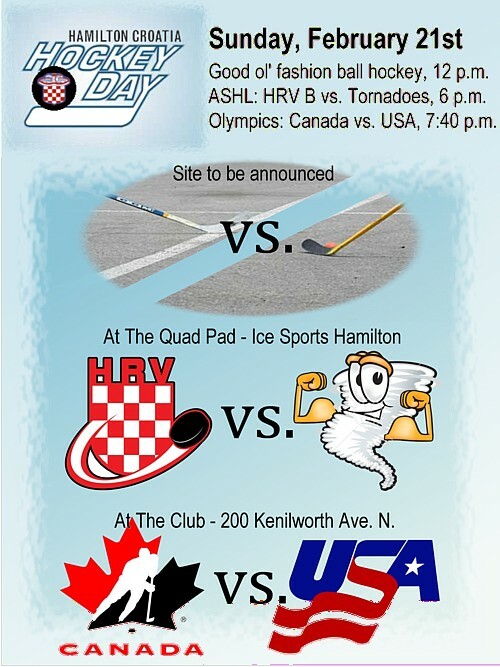 Frank Perin — On Sunday, February 21st, 2010, Hamilton Croatia hosted their Inaugural Hockey Day. The day portion – a fantastic ball hockey tournament – was held at the Outdoor Ball Hockey Arena at Fifty Point Conservation in Winona, Ontario. The evening portion began with players and fans taking in a HRV B game at the Quad Pad, and the day was capped off by a group of enthusiasts driving down to the Club on Kenilworth Avenue to witness Canada’s loss to the United States in their 2010 Olympic round-robin game. Actually, about six guys really ended the marathon day by remaining at the Club until 2 a.m. cheering on the Canadian Women’s Curling Team. There were 40 total players split into four teams using a random draw. Team Norris (White Jerseys): Tom Bilic (g); Tommy Grubisic; Ivan Rados; Mike Domjancic; Steve Jalsevac; Mike Kovacic; J.J. Grubisic; Mark Vuksan; Jason Grbavac; Bernie Rejc. Team Adams (Red Jerseys): Mike Jurincic (g); Tom Rimac; Greg Zdelar; Mijo Rados; Mark Poklecki; Kruno Rimac; Pere Gavran; Ivan Pasalic; Nick Petrina; Edi Rejc. Team Smythe (Black Jerseys): Steven Grguric (g); John DiTrappani; Toma Poklecki; Joey Katkic; Jason Krlin; Bobby Jazvac; Steve Radencic; Pete Rados; Ivan Grubisic; Joey Poklecki. Team Patrick (Orange Jerseys): Frank Perin (g); Steve Mlinarevic; Pat Milisenda; Dan Stajduhar; John Poklecki; Jasenko Filipovic; Branko Kurpis; Rob Busija; Danny Benic; Matt Krasic. Team Adams vs. Team Norris, 12 p.m. Team Smythe vs. Team Patrick, 12:25 p.m. Team Adams vs. Team Smythe, 12:50 p.m. Team Norris vs. Team Patrick, 1:15 p.m. Team Norris vs. Team Smythe, 1:40 p.m. Team Adams vs. Team Patrick, 2:05 p.m.